Demonstrating the power of educational innovation to transform learning, energize communities and inspire creative thinking. We have a Kapla Block room at the entrance to our school. Its entire purpose is to allow students to build. Children come in the morning and at the end of the day to work on projects and to play. Sometimes parents help, mostly they don't. 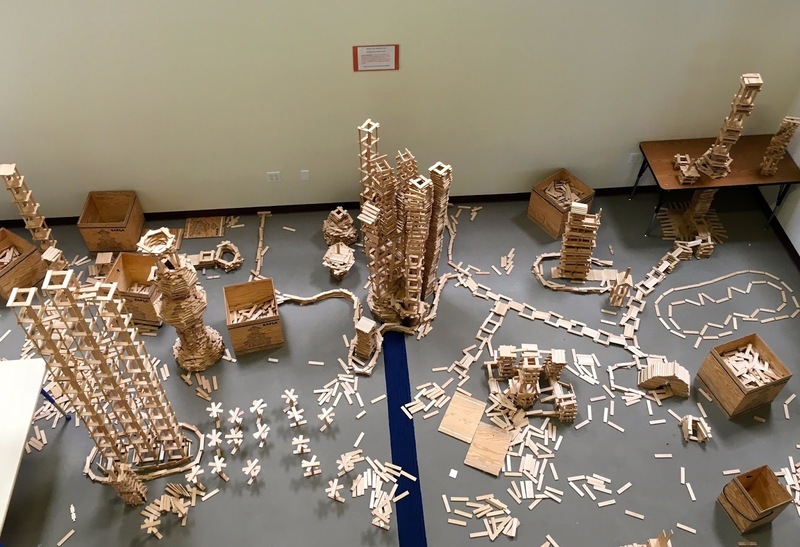 There is no organized curriculum connected to the blocks. There are no pictures of projects for students to refer to. There is simply a room full of blocks. Not only is this a room for creativity, this is a room for navigating emotions and understanding the concept of impermanence. These block creations can't stay there forever. Sometimes they come down on purpose, sometimes by accident. But when they come down, there is often a sense of loss that kids must work through. At Synapse, social emotional learning is a core tenant of our school. Navigating emotions is one of the eight core SEL competencies that we teach. This Kapla block room has been a great vehicle for this important lesson. If you are planning to be at NAIS in San Francisco this year (or will be in the Bay Area), don't miss Edcamp Independent Schools, a free edcamp experience directly following the NAIS Annual Conference (currently in its 4th year). This year we will gather at Katherine Delmar Burke School in San Francisco, CA on Saturday, February 27, 2016. This is an opportunity for thoughtful educators to join in a conversation about what is happening right now in the world of Independent schools. It is an opportunity for you to lead a session about a topic you are passionate about. It is an opportunity to connect in a smaller group with Independent School folks from all over the country and the world. Registration is about to open up and space is limited, so please fill out this form if you are interested in attending and we will send you registration information when it is available. Check out the website to find out more. Edcamp with Students - Finally! This Friday the middle school students at Synapse School (where I am the Assistant Head of School), participated in their first student lead #Edcamp. I have been trying to get an Edcamp for kids going at my schools since I discovered how empowering participant driven learning experiences can be eight years ago. It took my amazing colleagues at Synapse to bring it to life. And I actually had very little to do with it. Every year Synapse chooses a Changemaker to focus on for the year. This year our Changemaker is Benjamin Franklin. It turns out that Benjamin Franklin formed his own Edcamp style group that met weekly to discuss different topics. He called them Juntos. Using that as a connection, students considered the topics they would like to discuss and our own #EdcampJunto was formed. My colleagues Federico Chialvo @federicochialvo, Katie Morgan @fxluvr and Stephanie Seto, @shsetos really took the lead on making this happen. Stephanie put together an excellent lesson plan that steps through the entire process. We introduced the concept of Juntos to students in a whole school meeting and then invited them to propose topics that they would like to discuss. Using a simple Google Form, students proposed topics and then indicated if they would be willing to facilitate that session. Once we gathered all of the topics, we created a Google Form for students to vote on the topics that they would be most interested in talking about. Then Stephanie put together a schedule of the most popular topics. We divided the schedule into four 20 minute sessions. We also decided to keep the popular sessions on the schedule that didn't have facilitators and allow the kids in the room to figure out who would lead (if anyone). Before we started the sessions, I gave students a little background on Edcamps and explained some of the rules. We decided not to let students leave sessions once they had chosen them (ie - rule of two feet). With middle schoolers that can get complicated. There was an adult in each room, but they were not there to lead the group. However, they did participate. Here is the schedule we ended up with for the day. What will Earth look like in 10 years? Why do things go viral? What is the best book ever? What is the best movie of the 2000s? Will Star Wars 7 be any good? If no, what will be the outcome? Why do you get socks and clothes for Christmas? When we first introduced the juntos for the day, a student asked, "Is the the first Junto or the last one?" I told her, that was up to the students. If they took this seriously we would love to do this again. From everything I have heard, the day was a huge success. My daughter facilitated 3 different sessions (she is in the 6th grade at my school) and this morning she asked me if we could have Juntos every Friday. We will definitely debrief the experience, iterate and repeat! Have I mentioned how much I love my school lately? Wow! - the things that my faculty and students do there blow me away everyday. Stay tuned for more posts on all of the great things that are going on in this amazing place. 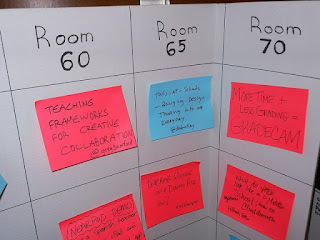 I am also helping to organize another Edcamp Independent Schools #edcampIS on February 27th, the Saturday after the NAIS confernce, at Burke's School in San Francisco. I hope you see some of you there. The Edcamp Foundation is organizing a campaign for #GivingTuesday, which will begin on the Tuesday after Black Friday and Cyber Monday. It is a day to encourage people to give to their favorite nonprofits, so they are hoping to connect with Edcamp folks around the world. 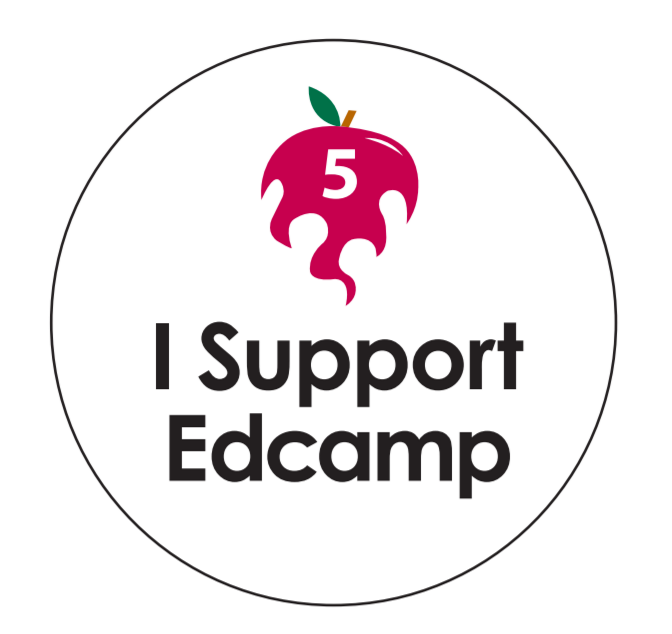 Click here to participate in the $5 for 5 years of Edcamp. The Donate button on the website is all that you need! "While it will raise money, the primary purpose is to show the tremendous reach of the Edcamp movement. Because every Edcamp is independently run, there is no master list of organizers or participants, so when we talk to funders, it is all very general. It would be wonderful to be able to point to this campaign and show how enthusiastic Edcamp folks are and how widespread we are. It would be great to be able to light up a map with every $5 donation that we receive. The funds will go into the Discovery grants program that we are rolling out next year. Through it, teachers will be able to apply to the Edcamp Foundation for funds to implement an idea with their students that they learned at an Edcamp." Please donate $5.00 on Tuesday, 12/1 or at anytime between now and the end of 2015. The Way Education Should Be! In July of this year I started a new job. I am now the Assistant Head of School for Synapse School in Menlo Park, CA. The past few months have been a whirlwind of getting to know the school, the administration, the faculty and the kids. Synapse is a very young school (it is in its 7th year) with a progressive approach to learning and a mission to educate change makers. I am so happy to finally be at a school that truly aligns with my educational philosophy. 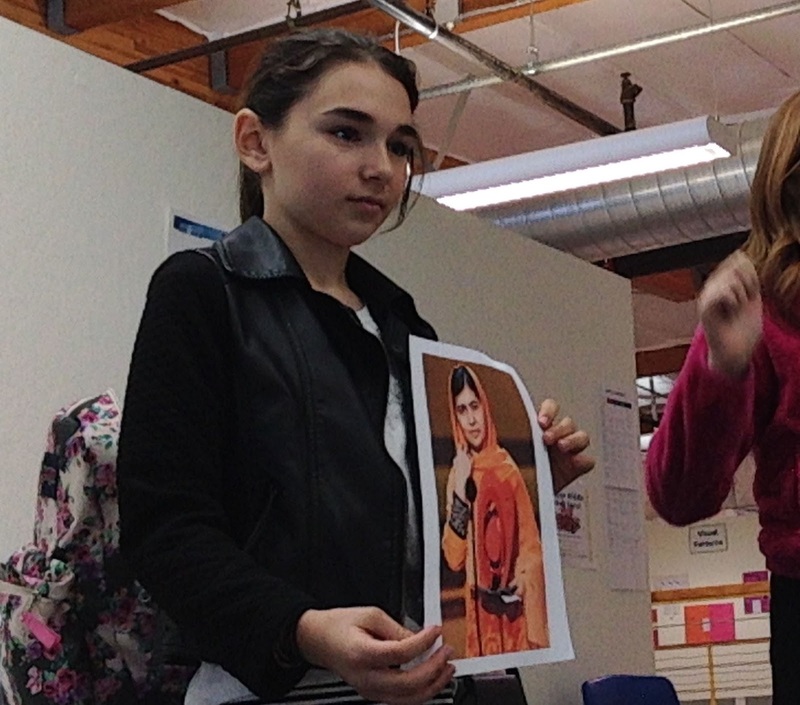 Alfie Kohn wrote a wonderful article defining progressive education, I am so happy to say, Synapse fits his definition to a T.
This week culminated in a "Portfolio Day" that showcased students' first trimester learning. Each child guided their parents through the many artifacts of their understandings, becoming the teacher and showing their family members evidence of what they had learned. As I went through the day both as an administrator and as a parent (my children are in 6th and 7th grade at Synapse), I was struck by the "rightness" of this school. This is how education should be, focused on the learner, not on the grade, experiential, constructivist and project based. If you have been reading my blog over the years, I'm sure you can identify with my feelings. I have been looking for a school like this ever since I wrote my Common Principles for 21st Century Schools. I feel I have finally found my educational home. If you are planning a visit to Northern California, please reach out if you would like to visit. This weekend I helped to organize Edcamp San Jose, my first west-coast edcamp. Thanks to an amazing team of organizers, Travis Phelps, Diane Wharton, Mary Fran Lynch, Todd Feinberg and Matthew Cordes, and a great group of participants it was a wonderful day. At the end of the day I was fortunate enough to attend Elana Leoni's session on writing and reflecting. She gave us time to write about the day and encouraged us to be creative with our writing style. What follows is the writing I did that afternoon. She had been to many EdCamps before, she helped organize EdCamps before they were called EdCamps (remember EdubloggerconEast). Back home in Boston everyone knew her. 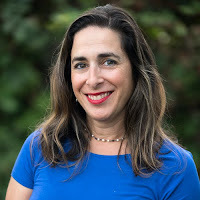 Her EdCampBoston team had been together since 2011. Over 300 people attended that conference and they all knew Liz. But since moving to California, she had had to re-establish herself, start over, begin again. It was a humbling experience. “Don’t you know who I am” she would often find herself thinking. Of course you can’t say things like that out loud. And she knew the answer, they had no idea who she was. EdcampSanJose was a way for her to start again. To meet new people, to find her place. But it is hard to start again, especially when you feel you have come so far. She knew it was good for her, but still it was hard. The day was cloudy. It had actually rained that morning, an uncommon event in her new hometown. As she started setting up tables and putting out food, she wondered how it would go, who would show up, what sessions would be proposed. As the attendees arrived, she held out her hand, introduced herself, invited them to fill out a name tag and propose a session. 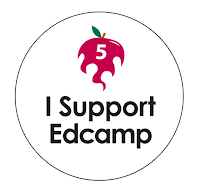 She asked, “Have you been to an edcamp before?” The answer from many was “No, this is my first time.” She could hear the nervousness in their voices and the excitement too. Flipping into her encouraging mode, she assured them that they would have a great day. Reassuring herself as she said the words. As the room filled it was finally time to do the icebreaker. She thought back to all of the times she had run this ice breaker as she looked out into the room. Holding the microphone and introducing the activity felt familiar (those who know her, know how much she loves a microphone). As people began to introduce themselves to each other, the volume in the room began to rise. The other organizers filled the board with sessions and day was about to begin. Moving 3,000 miles across the country has not been easy. It has been exciting at times, exhausting, entertaining and fun, but it hasn’t been easy. Beginning again never is. But it can only be your first time once, the least I can do is enjoy the newness and make the most of it. I have to trust that I will find my place eventually. And the journey is half the fun. Isn’t it? Thank you to all of the people who have welcomed me along the way! I am the Assistant Head of School at Synapse School, a K-8 independent school in Menlo Park, CA.